Galway Bay Golf Resort near Oranmore is one of the most scenic golf courses in Ireland. It overlooks the bay, with Galway city and the Aran Islands in the distance. The course is very challenging and a great test for more gifted golfers. Or so I am told, as everything I know about golf can be written on the back of a postage stamp. Perched at the edge of the Atlantic, the Saltwater Bar & Grill at The Galway Bay Golf Resort is a favourite haunt of golfers, tourists, and locals alike. With a good range of single malts, wines, and draught beers, the bar is the perfect place to quench your thirst after a great day's golfing. The clubhouse is central to all the club’s events and social activities, as well as for many private functions. It is perfect for tea, coffee, and some light snacks before venturing out on the course or it could offer a warming Irish coffee or hot whiskey for the returning golfer on these colder days. The spacious restaurant area upstairs is modern and comfortable, there is ample parking and a confident team in the kitchen. While the Rinville Point Restaurant here may be the ideal place to celebrate that ‘hole-in-one’ on the plush fairways and manicured greens of its PGA Championship golf course, luckily for us it is not limited to golfers. It is open to all and is a great option for meeting friends, family outings, or groups. The restaurant offers stunning views from every corner with the panoramic bay as a backdrop. It is uniquely positioned alongside the first tee and provides a great location to watch all the on course action. There is something for all tastes and for all times of the day. All meals are covered from a full three course dinner to just a quiet coffee and scone. The selection of food in the bar includes generous steaks and salads, creamy pasta, and indulgent desserts. Choose from a selection of starters, main courses, and sandwiches with daily specials and a full bar. You could warm up with your hands wrapped around a bowl of creamy seafood chowder. The restaurant offers diners a diverse à la carte menu featuring a broad selection of delicious traditional and modern dishes. Best of all is a great value Sunday lunch. 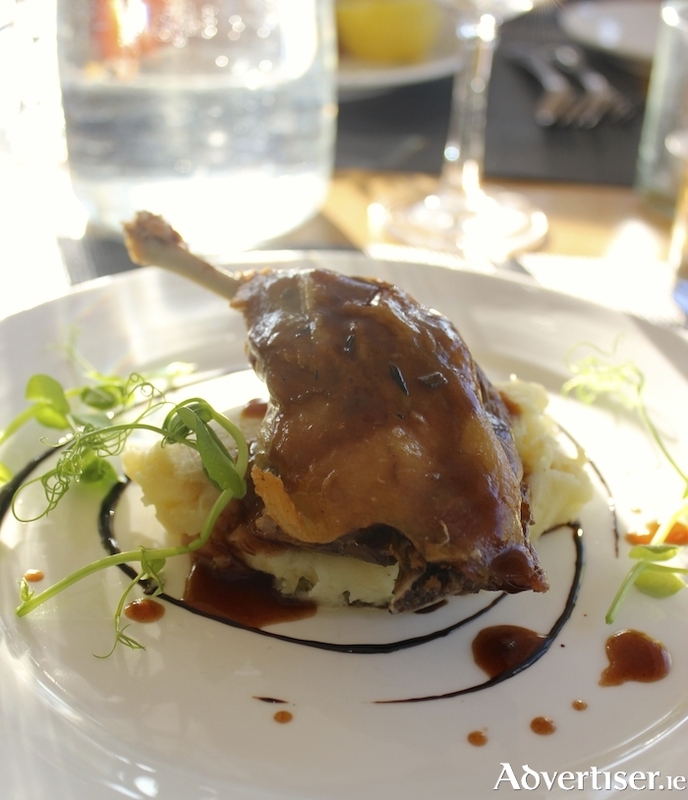 For starters we tried the west coast smoked salmon and crab and confit of slow cooked Barbary duck leg served on a bed of sage and apple mash with a cassis reduction - both delicious. This was followed by pork belly and a generous portion of baked sea-bass with tiger prawn ragout in a filo basket. The Renville Room dessert assiette, a selection of lemon roulade, chocolate profiteroles, and a raspberry bavarois, and an excellent melting chocolate fondant with pistachio ice cream completed the meal. The Sunday lunch menu is served from 12.30pm to 3.30pm upstairs in the clubhouse, with the option of two courses for €20.95 or three courses for €24.95. Children eat for free with a complimentary main course (from the children’s menu ) when accompanied by a paying adult. There is also a kiddies' corner with entertainment and face painting for the littlest diners. Needless to say, with this sort of value, it is a busy spot on a Sunday so I would recommend booking. Now that the summer golfing season is over, and with the shortening of daylight hours, it is a great little detour to make. Good food, friendly staff, and unbeatable views, Galway Bay Golf Resort offers great value Sunday dining in Oranmore.